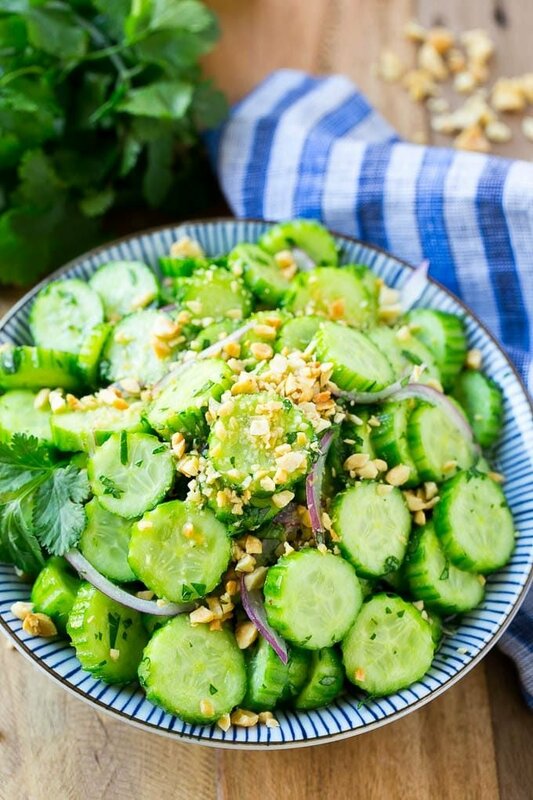 This refreshing Thai cucumber salad recipe tastes just like the restaurant version, and it only takes minutes to make! 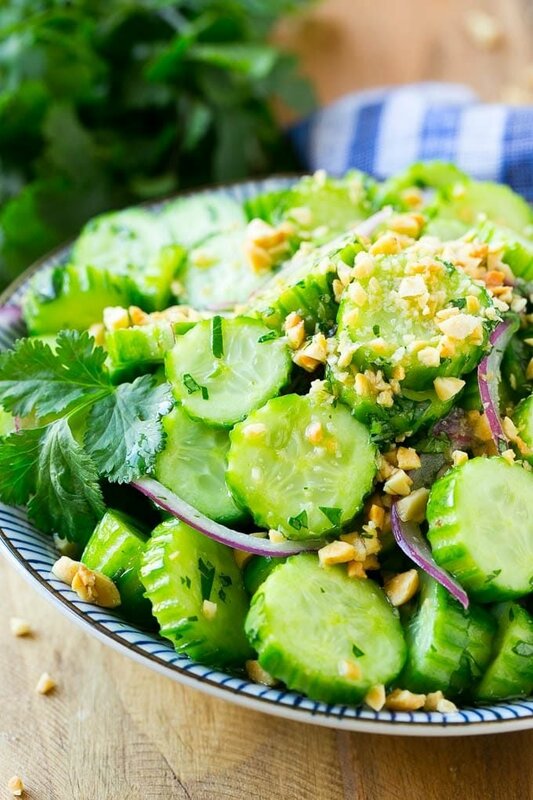 Thinly sliced cucumbers are tossed in a sweet and savory dressing along with red onions, peanuts and herbs for the perfect side dish. I happen to love Thai food, and I often make a full Thai meal at home with Thai noodles, peanut chicken and this simple yet satisfying cucumber salad. I posted this Asian cucumber salad recipe a few weeks ago, and you all loved it so much that I decided another one was in order. This time around I’ve got a Thai cucumber salad, and it’s so delicious that I may or may not have eaten the entire batch for lunch one day! Every time we go to a Thai restaurant, my husband orders chicken satay. And when they bring out the satay, they bring out this tiny bowl of cucumber salad to go along with it but it’s never enough! This recipe tastes just like the restaurant version, and it’s crazy simple to make. 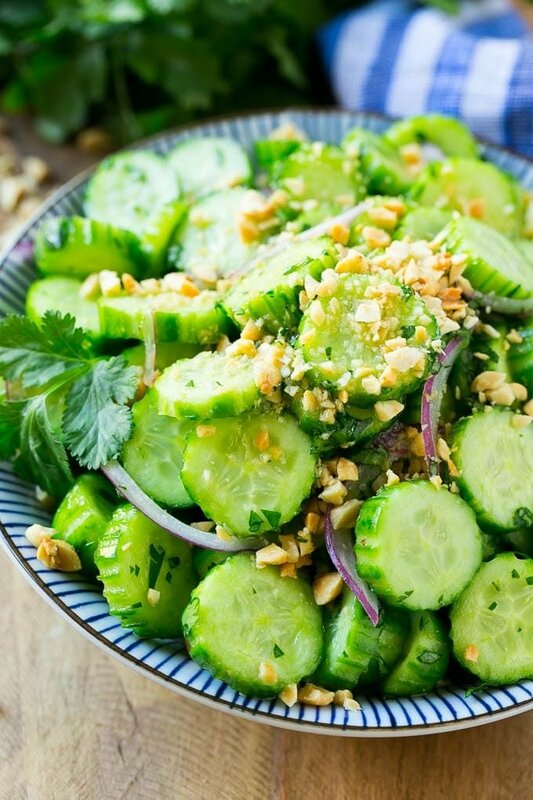 How do you make Thai cucumber salad? If you’ve ever wondered how to make Thai cucumber salad, the process is pretty simple. Sliced cucumbers are salted, then put in a bowl with red onions and tossed in a simple dressing of rice vinegar and sugar. Add some chopped cilantro and peanuts then serve. I use small cucumbers (Persian style) for this recipe, because that’s what my Thai restaurant uses. If you can’t find the little cucumbers, try an english cucumber that’s been quartered and sliced. My Thai restaurant’s cucumbers have little grooves on the outside, which is both pretty, and functional to let the salad dressing soak into the nooks and crannies. I copied this effect by peeling my cucumbers with a lemon zester, but that’s an optional step. Salting the cucumbers is imperative here; it makes the cucumbers stay crisp in the salad. You can add other vegetables such as thinly sliced carrots or red bell peppers for a different flavor. This Thai cucumber salad is best served after it’s had a chance to soak up some of the dressing, so let it sit for at least 20 minutes, or make it up to a day in advance, then enjoy! 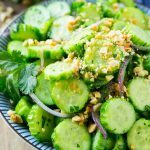 This thai cucumber salad recipe tastes just like the restaurant version, and it only takes minutes to make! Place the cucumbers in a colander and sprinkle the salt over them. Toss to coat the cucumber slices in salt. Let sit 10 minutes. Use a paper towel to blot the cucumber slices dry. Place the rice vinegar and sugar in a small bowl. Microwave for 30 seconds and stir until sugar is dissolved. Place the cucumbers and red onion in a large bowl, then pour the rice vinegar mixture over the top. Add the cilantro to the cucumber mixture and stir until combined. Cover and refrigerate for at least 20 minutes, or up to 24 hours. Sprinkle the peanuts over the top, then serve. You’re free to add that if you like, my local Thai restaurants don’t include either!! I am trying a low carb diet, has anyone tried a sugar substitute when making the dressing for this salad. If so which one and was it good? I have not tried a sugar substitute, but any granulated substitute that dissolves should work. This salad looks soooo good! This looks like my favorite salad at my local Thai restaurant. I can’t wait to make this salad!